last week i received an e-mail from True & Co. asking if i would like to give their service a try. perhaps they are psychic and could see the state of my intimates collection was in desperate need of a pick me up? regardless, yes i needed new bras, yes i hate shopping for bras with my children and yes please spare me the awkwardness of having someone analyze my cups to tell me whether or not they fit. 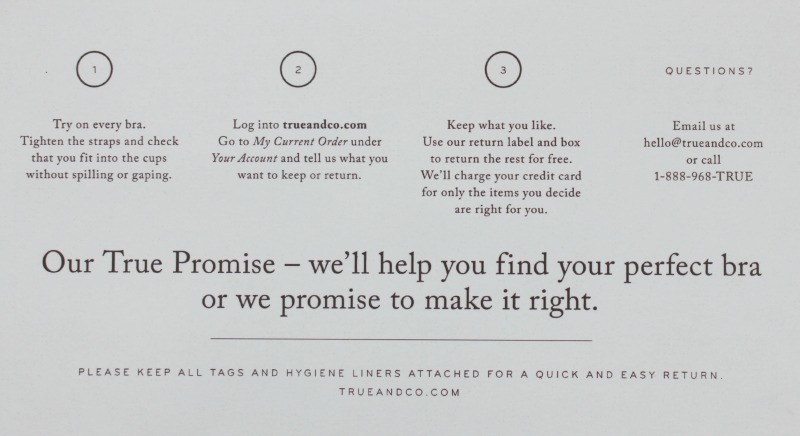 straight to the True & Co. website i went to order my much needed bra replacements. 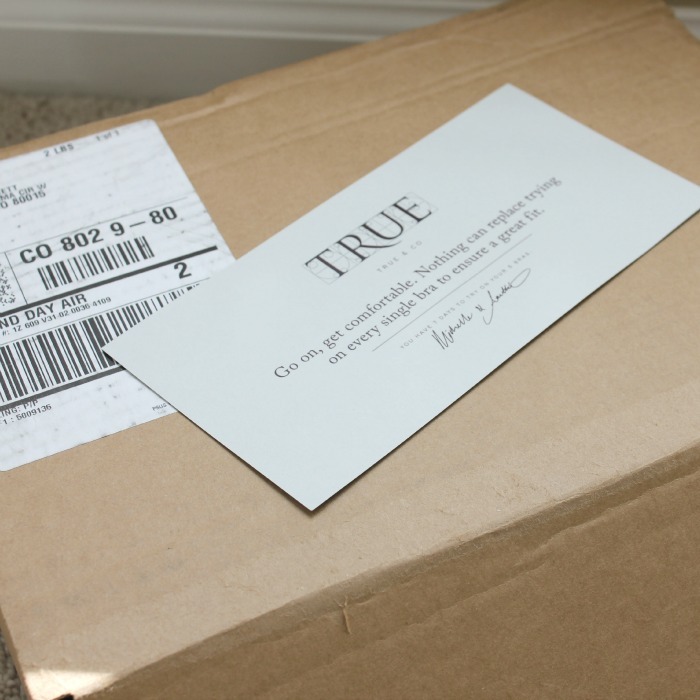 True & Co. is a personal bra shop online. you fill out a (quick!) survey that helps you analyze whether or not your current size is the correct fit. once you select your issues and what you are looking for, the genius brain inside the True & Co. website personally selects two bra options and you are given a variety to select three options of your own. with a minimal deposit all five bras are shipped (quickly!) to your home where you can try on, check fit, determine the winner and send the remaining brassieres back (with an included return shipping label). easy, right? determine size, select your favorites, wait for arrival, try on bras in the privacy of your home and return remaining bras. did i mention that this was quick?! my delivery package, thank you 2nd day air! my five piece selection - bra #1 and #5 were my personal choices. hello, practical. a True tag is placed on every bra. once removed you have 'purchased' the bra. okay ladies, if bra shopping has always felt like a bit of a headache - let's face it, it is only fun when you're 19 - this is your solution. go ahead and give them a try, their magical 'bra fit' algorithm ensures a True fit every time.